A woman’s heart looks just like a man’s, but there are significant differences. For example, a woman’s heart is usually smaller as are some of its interior chambers. The walls that divide some of these chambers are thinner. A woman’s heart pumps faster than a man’s, but ejects about 10 percent less blood with each squeeze. When a woman is stressed, her pulse rate rises and her heart ejects more blood. When a man is stressed, the arteries of his heart constrict, raising his blood pressure. Why do these differences matter? They matter because gender plays a role in the symptoms, treatments, and outcomes of some common heart diseases. CAD, the leading cause of heart attack, is the same process in men and women. Extra fats circulating in the blood are deposited in the walls of the heart’s arteries, forming deposits called plaques. When these plaques grow slowly, they become hard and gradually narrow the artery, interfering with blood flow. More often the plaques remain soft and become unstable and rupture. This triggers a cascade of events that produces a blood clot that stops blood flow. Either way, the result is a heart attack. Despite this process, women have risk factors for CAD that men don’t have. They also tend to have different symptoms of heart attack. When symptoms appear, CAD may be more difficult to diagnose using conventional testing methods. Women have risk factors men don’t have. Certain diseases found only in women increase the risk of CAD. These include endometriosis, polycystic ovary disease (PCOS), diabetes, and high blood pressure that develops during pregnancy. Endometriosis has been found to raise the risk of developing CAD by 400 percent in women under age 40. Women also share traditional risk factors with men, such as high blood pressure, high blood sugar levels, high cholesterol levels, smoking, and obesity. Like men, women can be impacted by a family history of heart disease, particularly when a father or brother was diagnosed with CAD before age 55 or a mother or sister was diagnosed before age 65. Women are generally older when they have their first heart attack. Men are at risk for heart attack much earlier in life than women. Estrogen offers women some protection from heart disease until after menopause, when estrogen levels drop. This is why the average age for a heart attack in women is 70, but 66 in men. CAD in women is sometimes hard to diagnose. An X-ray movie (angiogram) taken during a cardiac catheterization is the gold standard test for finding narrowings or blockages in the heart’s large arteries. But CAD in women often affects the small arteries which cannot be clearly seen on an angiogram. That’s why any woman who is given the “all clear” signal after an angiogram and continues to have symptoms should see a cardiologist who specializes in women with heart disease. A heart attack is harder on a woman than a man. Women don’t tend to do as well as men after a heart attack. They often require a longer hospital stay and are more likely to die before leaving the hospital. This may be due to the fact that women who suffer a heart attack have more untreated risk factors, such as diabetes or high blood pressure. Sometimes, it’s because they put their families first and don’t take care of themselves. Women don’t always get the proper medications after a heart attack. After a heart attack, women are at greater risk of developing a blood clot that can cause another heart attack. For unknown reasons, they are not as likely to be given a drug to prevent such blood clots. This could explain why women are more likely than men to have a second heart attack within 12 months. Heart failure in men is usually caused by damage from a heart attack that prevents the muscle from contracting as forcefully as it should. On the other hand, women are more likely to develop heart failure when high blood pressure, chronic kidney disease, or other condition prevents their heart muscle from relaxing properly between beats. Women with this type of heart failure generally live longer than men with heart failure. But, they need frequent hospitalizations for shortness of breath, have limited physical ability, and are more likely to need nursing home care. Atrial fibrillation (afib) is a condition that causes the heart to beat in an irregular, often rapid, rhythm. Recent studies have found that women with afib have more symptoms, a worse quality of life, a higher likelihood of stroke, and worse outcomes than men. They also are more likely to be treated for afib with catheter ablation, but more likely to be re-hospitalized for afib after the procedure than men. 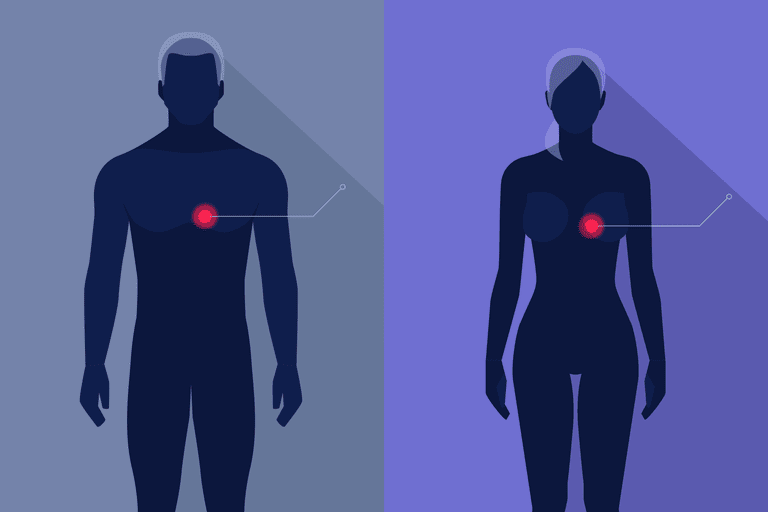 Despite these problems, women who receive treatment for afib are more likely to survive longer and are less likely to die from a heart problem than men with afib. Maintain a normal weight, blood pressure, blood lipid, and blood sugar levels. Dr. Cho is a cardiologist and section head at Cleveland Clinic's Tomsich Family Department of Cardiovascular Medicine. She is also the Director of the Women's Cardiovascular Center. Mu F, Rich-Edwards J, Rimm EB, et al. Endometriosis and risk of coronary heart disease. Circ Cardiovasc Qual Outcomes, 2016:9(3):257-264. McSweeney JC, Rosenfeld AG, Abel WM, et al. Preventing and experiencing ischemic heart disease as a woman: State of the Science. Circ, 2016;133(13):1302-1331. Mehta LS, Beckie TM, DeVon HA, et al. Acute myocardial infarction in women: A scientific statement from the American Heart Association. Circ, 2016; 133(9):916-947. Piccini JP, Simon DN, Steinberg BA, et al. Differences in clinical and functional outcomes of atrial fibrillation in women and men: Two-year results from the ORBIT-AF registry. JAMA Cardiol, 2016;1(3):282-291. Kaiser DW, Fan J, Schmitt S, et al. Gender differences in clinical outcomes after catheter ablation of atrial fibrillation. JACC Clin Electrophysiol, 2016;DOI:10.1016/j.jacep.2016.04.014.